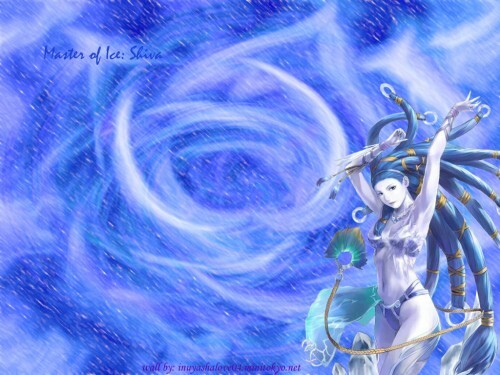 This time it's Shiva, a summon from Final Fantasy X. She's my fave summon, Bahamut a close second. Anyway, the scan is not mine. My brother found it for me, over a year ago and saved the site on his laptop, so I'd have a site to credit. But...his laptop crashed and he lost the site, and we can't find it. So, credit to the owner of the scan. Let's see...the bg work is mine. There is about 28 different layers in the bg alone. It took me a while to get colors for the bg that would fit with the scan of Shiva. There's not much left to say, so enjoy. Everything's ok but the texts I'd say, it needs more work on these parts.